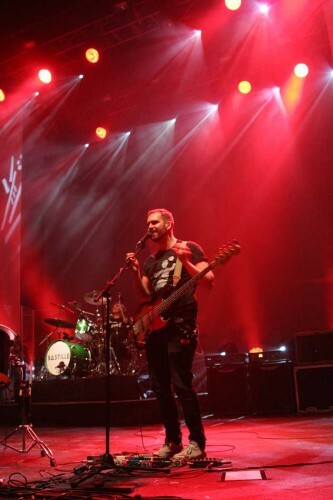 West London based lighting and visuals rental specialist Colour Sound Experiment is supplying lighting for the first full production tour by chart-topping indie rockers Bastille, who are rapidly ascending stars with their first album ‘Bad Blood’ and lighting designed by the very talented Will Dart. 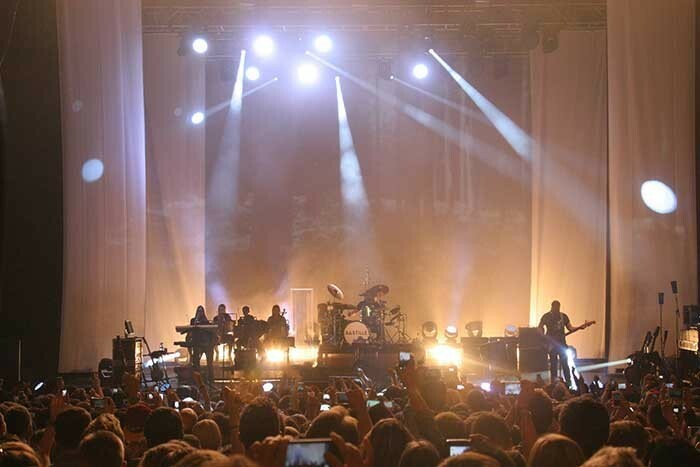 Earlier in the year Colour Sound provided a specials package for the summer festival season and as soon as this UK leg of the tour kicked in, the production requirements increased to include supplying a full system. Dart has worked with Colour Sound for the last couple of years and comments: “They are an excellent supplier in all aspects.” Dart sat down with the band ahead of the tour and they talked through several ideas, of which there were plenty. Projection was a large element of the show for the UK leg– although used very judiciously – so the lighting had to complement this and also take on equal importance as a medium. That was their starting point and then the shape of the stage evolved along with the general ambience of the show and how it was lit. Dart is a big fan of the Robe MMX Spot and he also knew they wanted to use these, together with Robe’s LED wash fixtures, having used both LEDWash 300s and 600s on the floor specials package in summer. The band wanted a clean, uncomplicated and stylish look to the stage, so he decided on 12 MMX Spots, 12 LEDWash 1200s and seven Atomic strobes, all in the roof. On the floor, they had six more MMX Spots, four LEDWash 600s, six LEDWash 300s, six atomics and eight Chroma-Q Color Force 72 LED battens which up-lit the projection gauze, so at times it took on a totally different form as a large brightly lit object. There was also a row of Codas along the bottom of this which produced a soft-glow tungsten up-light effect. Four-lite blinders were added for a big low-level tungsten blast from the floor silhouetting the band. “All the fixtures had to be multi-functional and were used for several different tasks,” comments Dart. A pair of legs either side of the screen were positioned about 10ft downstage to enhance the depth and these were also projection surfaces. Two more legs were added for the Brixton show – all of them also up-lit with Color Force battens and tungsten sources. Colour Sound commissioned the legs from J&C Joel, who used a special fabric that takes light exceptionally well from both front and rear. Using both Robe spot and the wash fixtures made sense because of the colour matching and other characteristics common to both types of luminaire. “The fantastic support” is another advantage of working with Colour Sound, he says, “Someone is always there to sort out whatever you need, and really quickly!” He adds that he also judges the quality of a supply company by the “quality of their solutions”.